Game Courier does not handle scoring of games. If someone is running a tournament using Game Courier, then it is up to that person to award scores. So, this person would have the discretion to score with either third or half points. > Is there a way for interfacing hexagonal chess variants software with winboard? 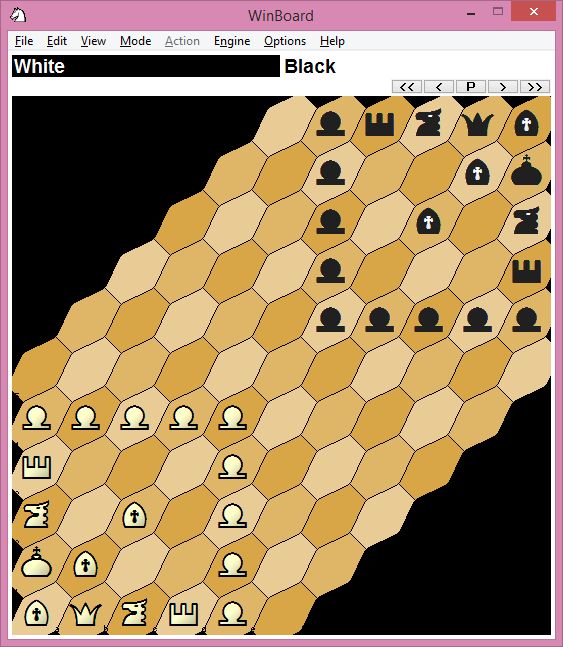 Is there a way for interfacing hexagonal chess variants software with winboard? Regarding the rule enforcing preset for Glinski's Hexagonal Chess, am I correct that it scores a stalemate as a 1/2-1/2 draw, rather than 3/4-1/4 for one side (as per the rules noted on that variant's webpage on CVP)? If yes, am I correct that Game Courier supports only three possible results for any finished game result being recorded for rating purposes by Game Courier, i.e. 1-0, 0-1 or 1/2-1/2? Wow, I'm lost. 1st time on variants. I want to play Glinski's hex chess with someone. I've been on for 3 minutes, and I can't figure out how to move and manipulate the board. Anyone want to play a game with me? Double moves and en passant are now being displayed as legal moves for Glinski's Hexagonal Chess. Glinski's Hexagonal Chess is showing legal moves, but I still have to fix Pawn double moves and en passant. I've just reached the point tonight where I'm too tired to continue thinking about it. I modified the preset a little, it supports the official coordinates and enforces the rules. I sumply used the alias order (the only order I understood from the developer's guide, AND it is quite useful.) One problem remains : the coordinates around the board didn't change to adopt the current system, which makes it too confusing to play with, especially if one is not used to the official system. I don't know how to modify that, but surely someone else can. Here's a link : /play/pbm/play.php?game%3DGlinski%27s+Hexagonal+Chess%26settings%3DPNG-Alfaerie-official I think it looks better than the other presets, and definitely better than the background glinski_hexagonal.gif It can be added to the list. There is a bug that appeared recently that causes the pieces in the 'Medium Sized Pieces' preset to be offset upwards.